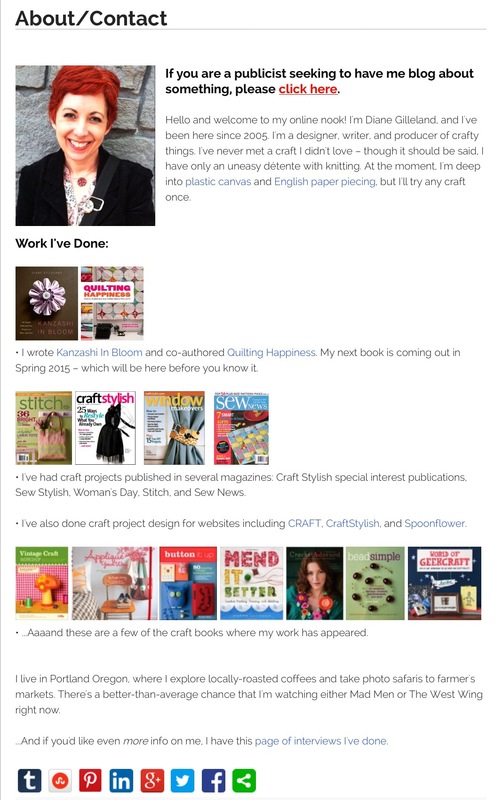 Completed Projects and Quilts!, Events, Tutorials, Uncategorized, what do you think? 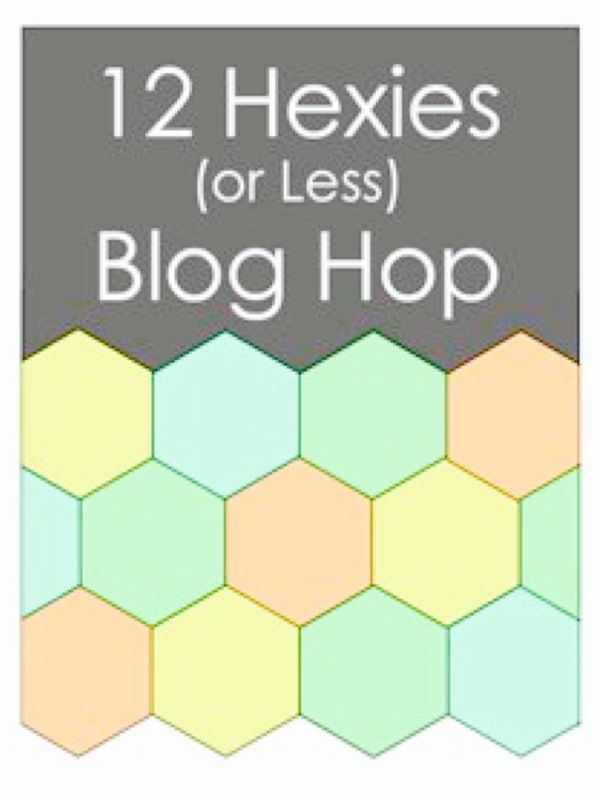 And I’m more than happy to start off Diane’s , from Crafty Pod, “12 Hexies (or less) Blog Hop”. 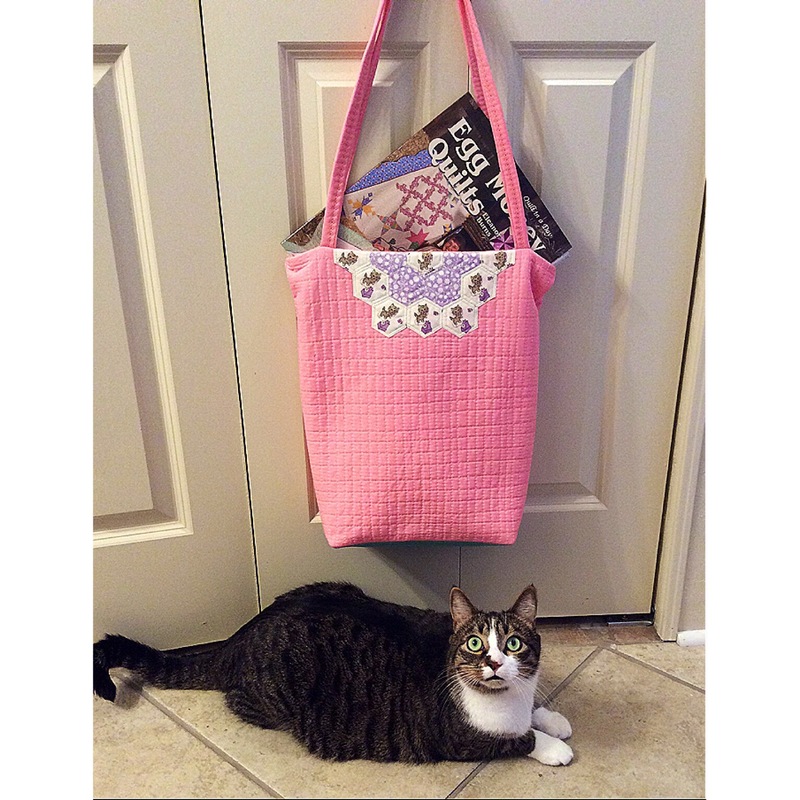 Diane is such a talented designer, writer and crafter, please check out her page and show her some love! 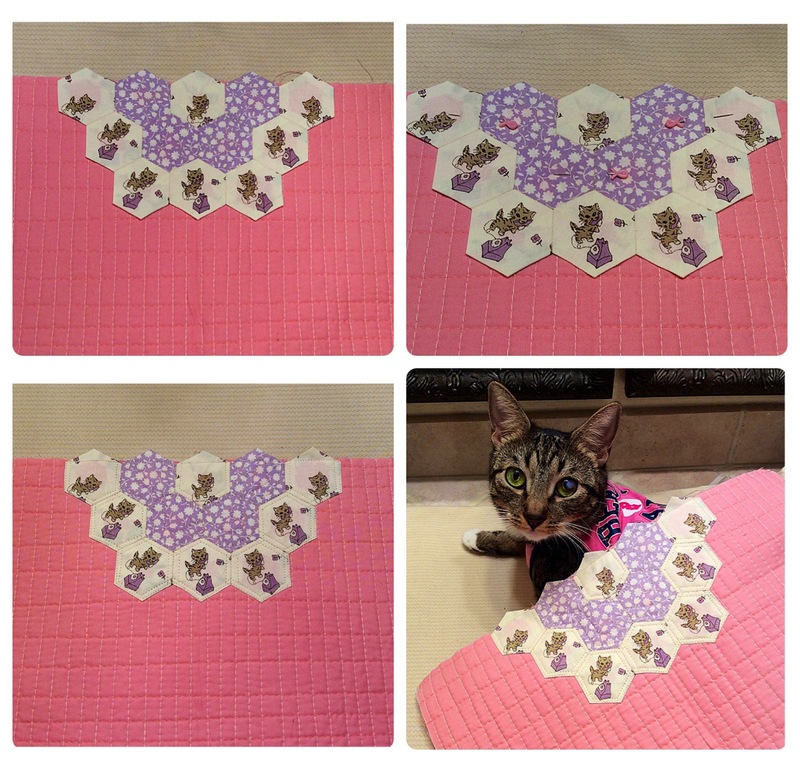 The rules for this Blog Hop were simple: make a project using 12 hexies or less. SO, I made myself a nice, long bag with 30’s (reproduction) kitty cat hexies! 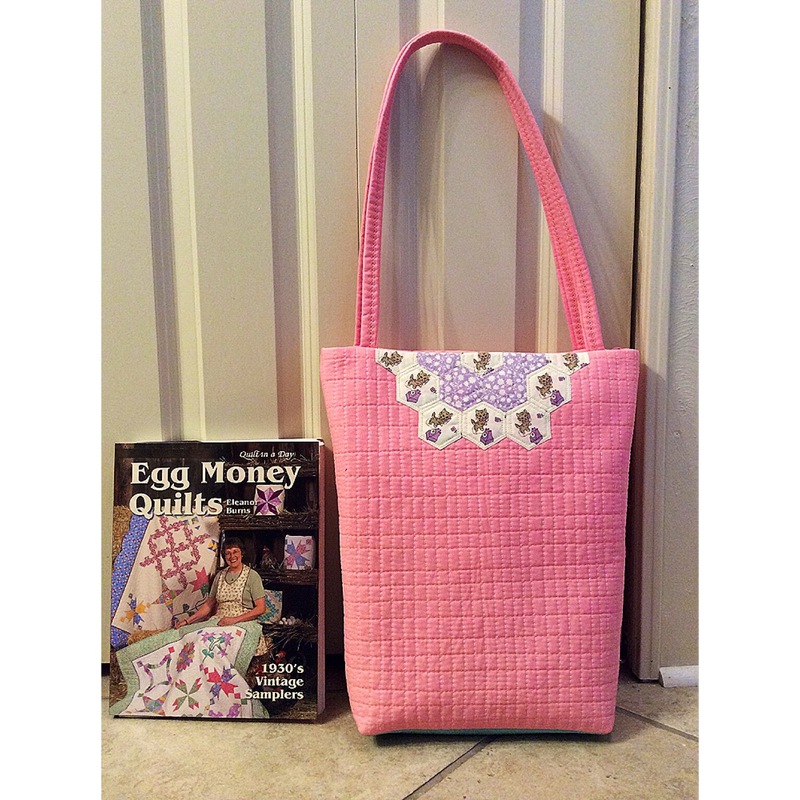 I used, my customized version of, Eleanor’s pattern, Grandmother’s Garden Purse, from her book “Egg Money Quilts“. 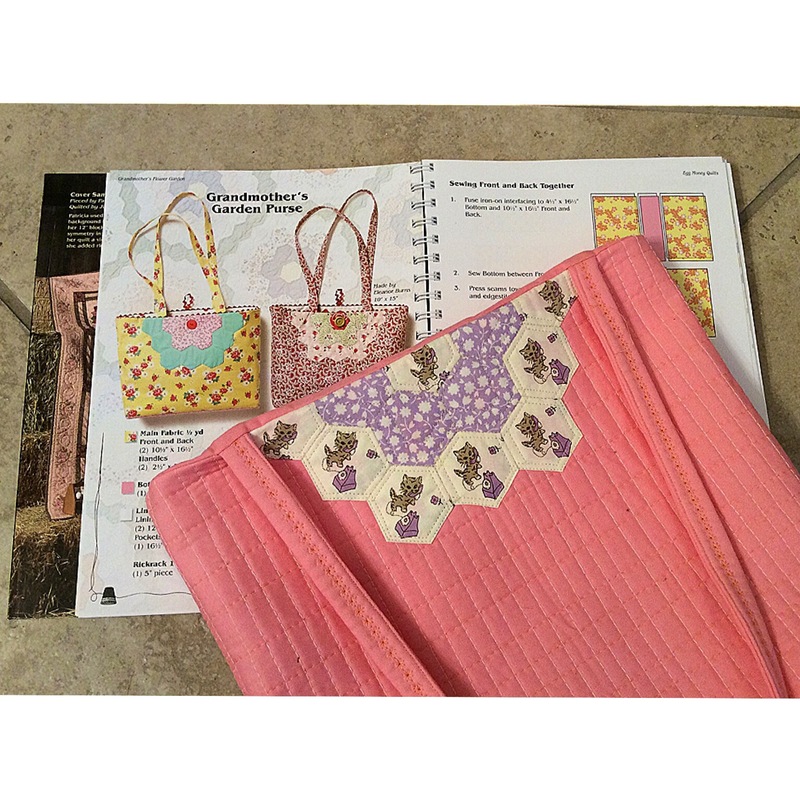 It’s such a neat book to use your 30’s and repro fabric! 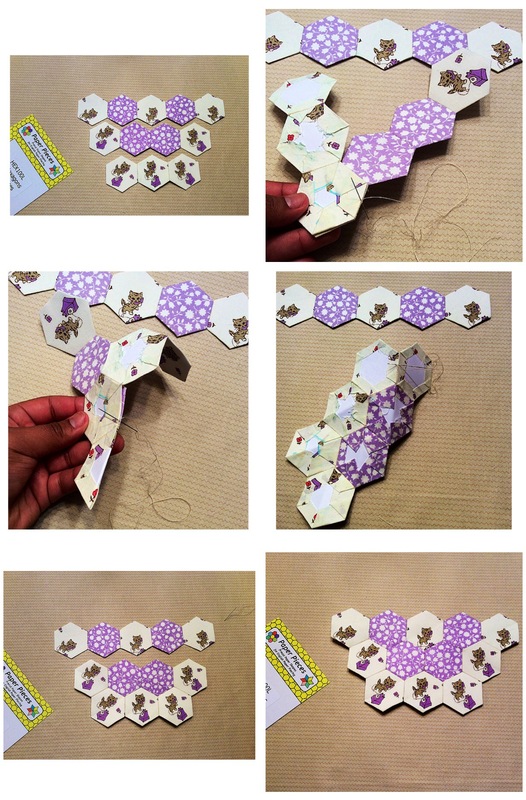 This post will be giving you a step by step tutorial on how to make the hexagon flower to embellish this purse. I am beginning to fall in love with 30’s prints and reproduction fabrics, I had fun picking out my fabrics for this bag! I cut out my bag pieces, ironed on my fusible, did some quilting and then set that aside to get my hexies started. 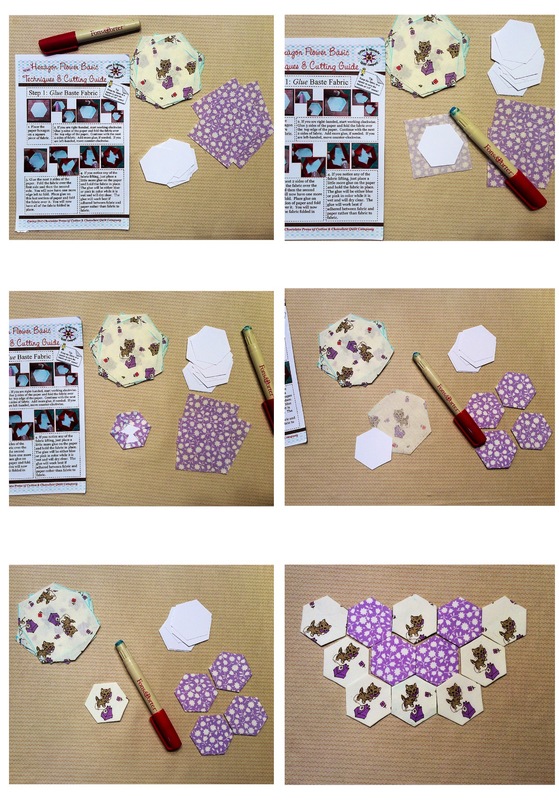 Now for my hexagons, I am using 1″ Paper Pieces hexagons. I like to glue baste them with Fons & Porter fabric glue pens. I am hooked on this stuff! It expedites my paper piecing to the max. I like to sew with John James needles #9, they’re the perfect size for sewing these little guys! Not too thick, not too short, JUST RIGHT! And I use 50 weight DMC thread, matching the fabric that I’m using of course. It’s originally machine embroidery thread, but it works great for paper piecing. Mini charms work perfect for 1″ hexagons. A mini charm is 2 and 1/2 inches squared, so I cut my hexagon fabric at that size. I love using this “Cotton and Chocolate Quilt Company” method of glue basting hexagons! It’s so easy! 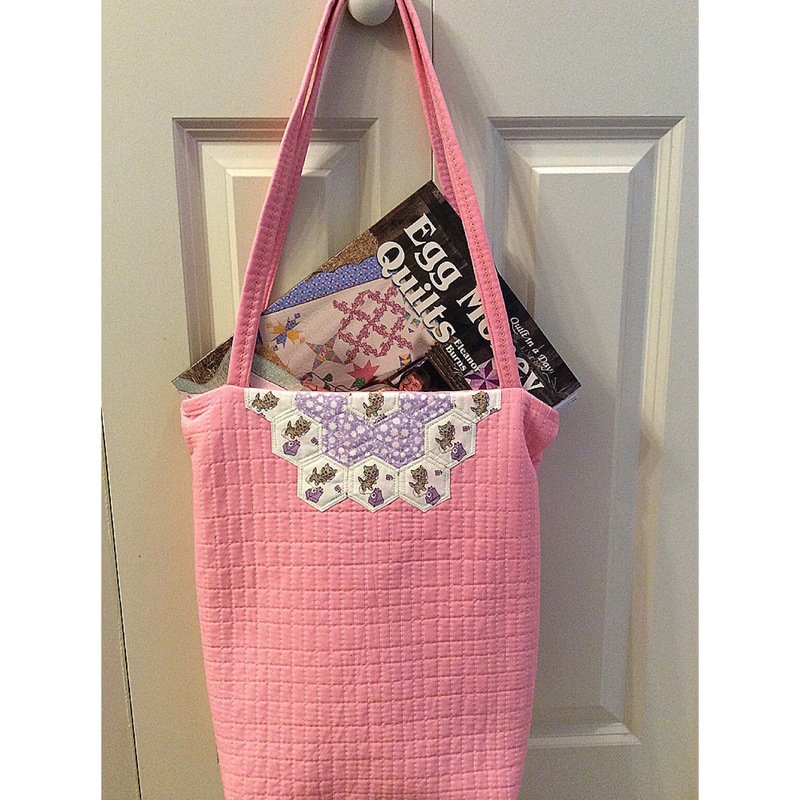 I bought this in a Beginners kit that they carry, check out their kits to get started with EPP! 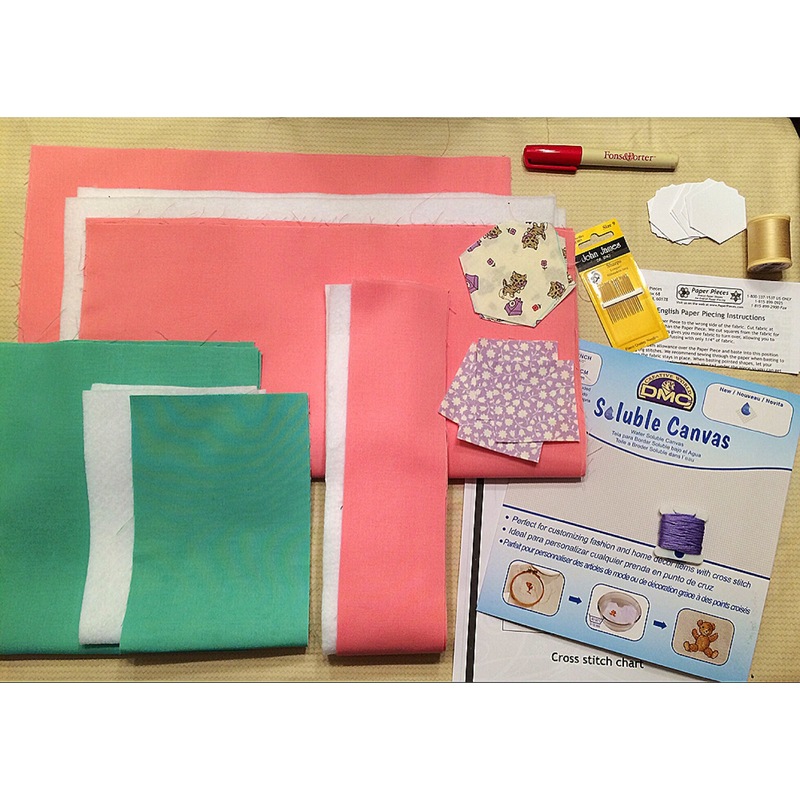 You simply center your paper piece on your fabric and glue down your sides with a dab of glue! It’s that easy! After all the hexagons are basted, I get them placed in the pattern I want them in. In a hexagon flower like this, I like to sew the hexagons in horizontal rows, and then sew the rows together. I find it easier to do it that way; I have a theory that it saves thread by not sewing 2-3 sides binding two hexagons but binding a continuous row of 3-4 hexagons. When I first sewed my first couple of hexagons, it took me a while to get the hang of sewing through both fabrics on the fold without catching the paper piece. It won’t be the end of the world if you stitch through some of the paper, you’ll just need to pull your papers out with a little more attention. 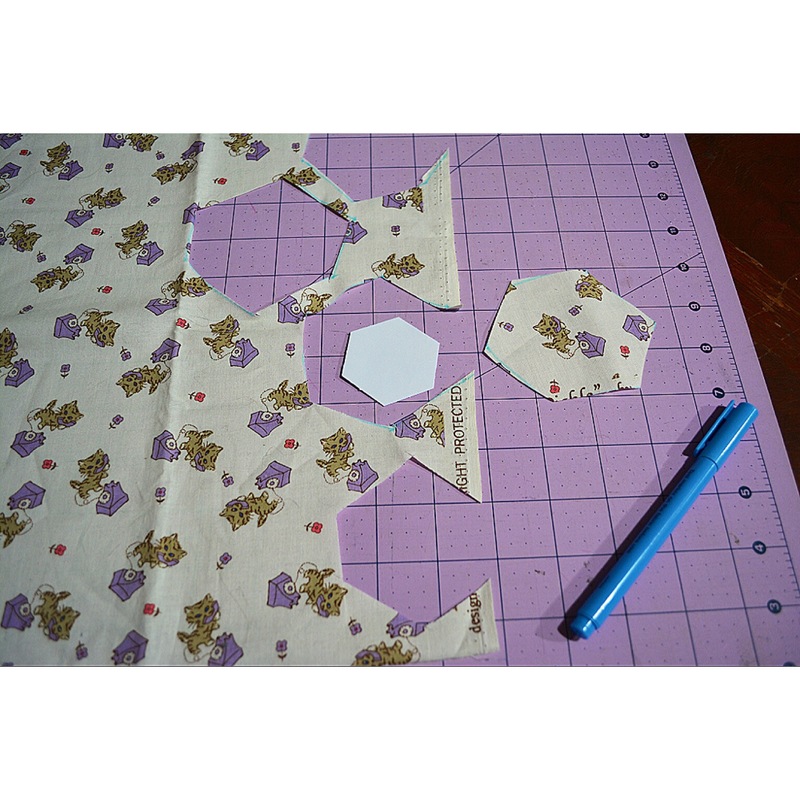 It’s ok to fold the papers in your hexagons throughout your sewing, Paper Pieces uses flexible yet firm card stock for their products. I love Paper Pieces! When I’m sewing my rows together, I fold the hexagons in half as firm as possible to make sure that my edges and corners are aligned. DO NOT overlook folding your hexagons when you have to… The worst feeling comes when you think you’re almost done and realize that your pieces will not match up. And here we are, THE FUN PART: pulling out the paper pieces!! Before I pull out my paper pieces, I steam the living daylights out of my hexagon piece! This keeps your hexagon’s edges straight and in place after you pull the paper pieces out. I carefully tug the ends of fabric glued to the paper piece until the paper is “free” to be pulled out. Again, if you happen to have sewed through the paper, pull out the paper piece carefully, you don’t want to pull a stitch and tear your fabric. Once all the papers are out, I steam my piece a tad more. 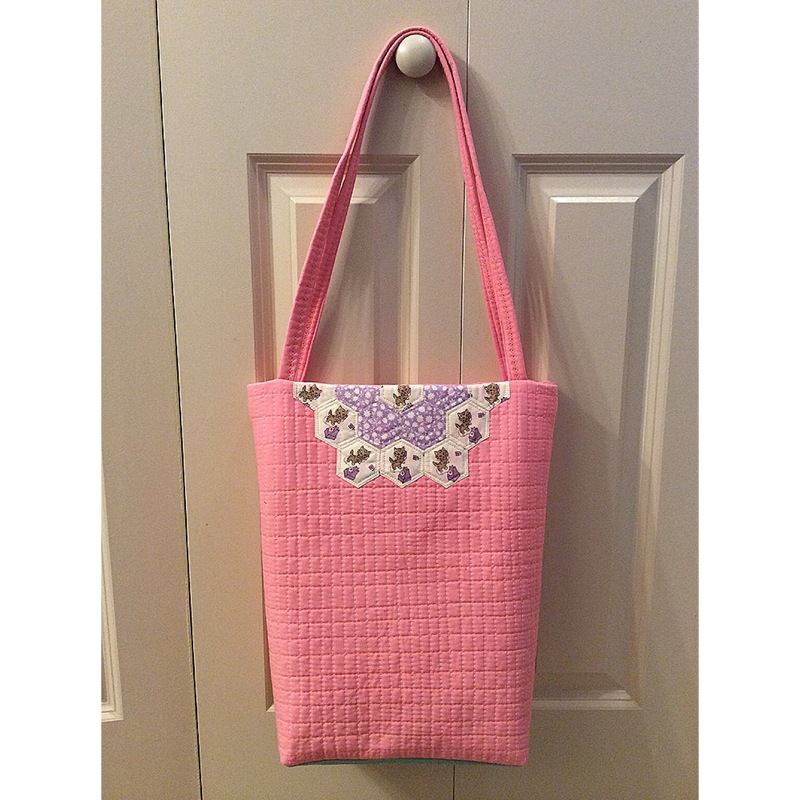 I center my hexagon flower on the top of my front bag piece, pin it down and quilt it. 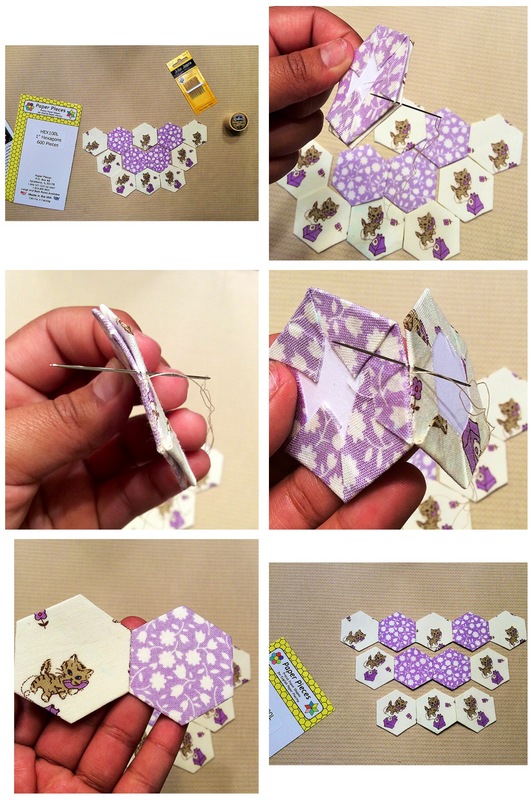 I hope that this “12 Hexies (or less) Blog Hop” inspires you to pick up some paper pieces! 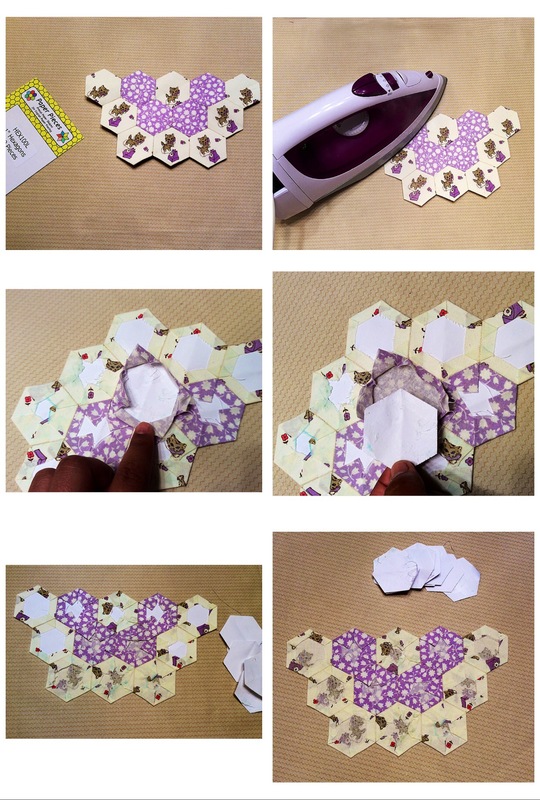 “Hop” on over to Maryline’s blog to see what she’s doing with her 12 hexies! This is really cute! I really love that kitty fabric! 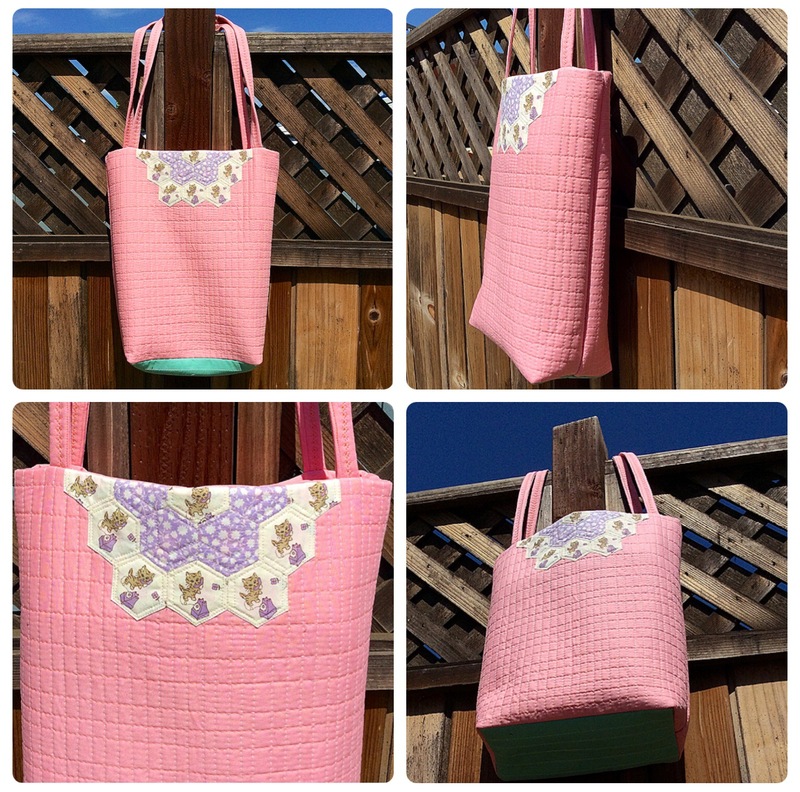 I really like the way the hexies add so much interest to the bag. 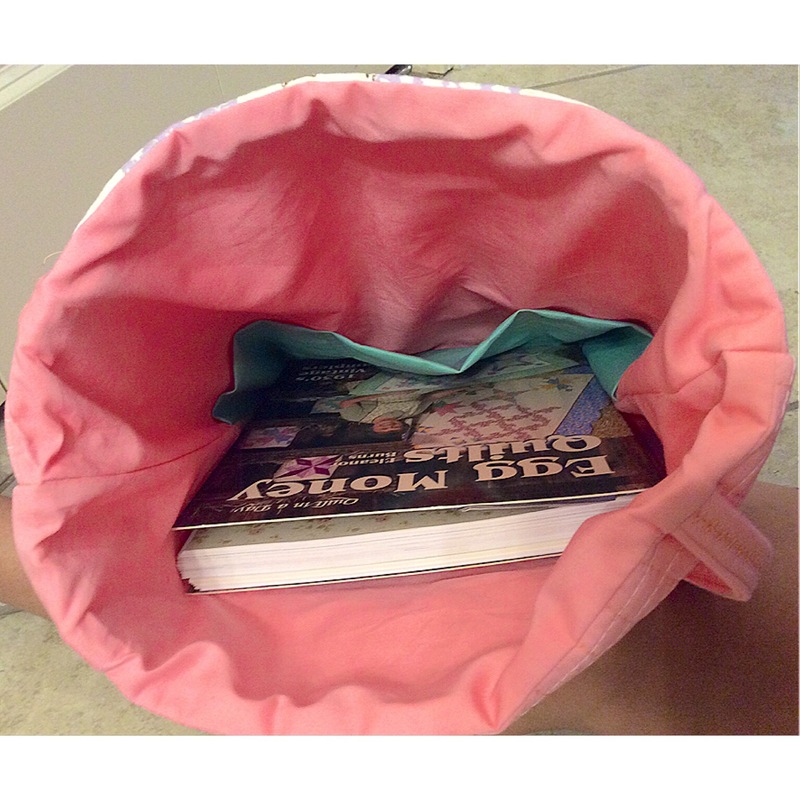 I might need to whip one of these up for myself, I can never have enough project bags. Great looking bag! And I totally agree that fussy cutting was absolutely the best choice for the kitty fabric as it creates an adorable accent. Love seeing how just a few well chosen hexies can add so much interest and sparkle to an ordinary garment or accessory. Previous Previous post: AccuQuilt’s Block Party Blog Hop- My Flowering Snowball project!